Encore scrubs are designed with the most economical scrub fabric. Inseam: 31", Petite 28 1/2", Tall 33 1/2"
Reversible pants feature drawstring waist and back pocket inside and out. Pants also feature four-panel construction (double needle inseam and out seam) for better fit. Drawstrings are color coded for easy size identification. A pant you will love so much you'll want to wear everywhere! 13 total colors with matching tops! Side vents at the bottom of this Modern Classic fit, natural rise, flare leg pant make a fashion statement. An adjustable front drawstring, back elastic waist, slash pockets, and one back patch pocket are also featured. Regular Inseam: 31", Petite: 28.5", Tall length: 34". Fabric: 65% Polyester/35% Cotton Poplin with Soil Release. Inseam: 31 1/2", Petite 29", Tall 33 1/2"
High performance, revolutionary PerforMAX™ 100% synthetic scrubs won't fade or shrink, and the fabric performs like athletic wear to wick moisture away from the skin, keeping you cool. Durable, finely-woven fabric stands up to the rigors of everyday wear, yet the incredibly soft, smooth texture glides easily without catching or grabbing. 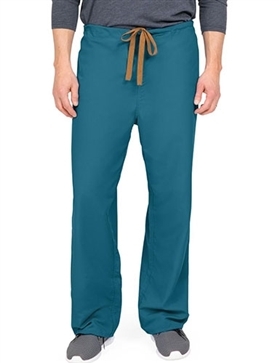 Unisex and reversible scrub pant with braided drawstring front-tie belt. The non-pilling fabric will not fade, shrink or transfer color. Performax 100% Polyester. Available in colors: Caribbean Blue, Ceil Blue, Evergreen, Jade, Misty Green, Navy, Royal Blue, Wine. Recommended Practices for Surgical Attire. In: 2011 Perioperative Standards and Recommended practices. Denver, CO: Association of PeriOperative Registered Nurses; 2011. PerforMAX Linen Energy Efficiency Study, Elmhurst Memorial Hospital Laundry, Elmhurst, IL 2009. Reversible pants have a drawstring waist and back pockets both inside and out! These pants are generously cut. 100% Cotton Fabric for a soft, comfortable feel! You'll never want to wear Polyester scrubs again! 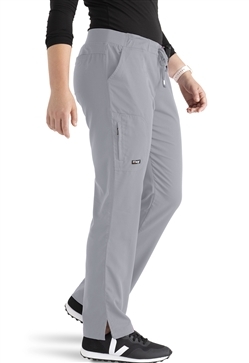 Inseam: Regular 31", Petite 29", Tall 33 1/2"
This 5 pocket, elastic back with drawstring front is just what you are looking for when it comes to comfortable scrub pants. These fabulous scrubs pants feature arcLux fabrics that keep you cool and confident during a long day at work! These Grey's Anatomy women's scrub pants have an endless selection of colors as well as many size possibilities. These pants are available in plus sizes, petite's & tall and are made just for you! Best selling scrub bottom in any color you want! XXS-5XL inseam 31 1/2", Petite inseam: 29 1/2", Tall inseam: 33 1/2"
What's not to love about the Grey's Anatomy uniforms? Designer styles, easy care fabric, wrinkle free, unbeatable softness, and cool comfort. Try out this NEW style to the Grey's Collection! This pant features: 6 pockets, straight leg style, modern rise waistline, tie front with elastic back, and double side cargo pockets. Suitable for all sizes: XXS-5XL. 31.5 inseam, Petite length: 29.5 inseam, Tall length: 33.5 inseam. Modern fit. 77% Polyester/23% Rayon. Available in colors: Spark, Kiwi, Purple Rain, Granite, Very Berry, Pink Pop, Hunter, Moonstruck, Wine, Bahama, Ceil Blue, New Royal, Indigo, Purple Rain, Steel, White, Black, Scarlet Red, Teal, Galaxy Blue, and Granite. These pants are perfectly designed for busy healthcare professionals. Flattering fit, cool and comfortable-ideal for active professionals with long shifts. Sizes: XXS-5XL Regular inseam: 30.5"